We have recently launched an online VOCAL DICTIONARY for Volume one and two of the book. Your students now can search for the meaning of any single vocabulary word from both books on this site and listen to its Farsi pronunciation. Kindle Interactive Edition: This Print Replica book features interactive audio content which is only supported on Fire Tablets (3rd Generation and above) and Kindle apps for Android phones and tablets. Customers who download this book to other devices will receive a standard Print Replica book. CONTAINING more than 1000 high-frequency vocabulary items as well as numerous idioms and idiomatic expressions, Book II of Persian: Here and Now has been crafted for teaching at the intermediate level – second year of Persian (Farsi) in academic programs. Book II as in the first volume, provides students with level-appropriate, grammatical and lexical material. It also introduces them to language within the culture through a variety of relevant, comprehensible, here and now representations of mainstream Iranian culture today. The textual material and the oral/written activities of this book have been structured and developed to be “communicative” in nature. Students are asked to engage in three different modes of communication: interpretive, interpersonal and presentational. 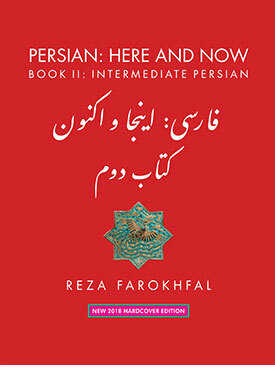 Book II of Persian: Here and Now is designed to equip second year students of Persian with competencies as stipulated in the ACTF proficiency guidelines. REZA FAROKHFAL teaches Persian Language and Civilization at the University of Colorado, Bolder. As an author in Iran, he wrote fiction and literary essays, but in recent years in America he has written works mostly in literary theory and cultural studies. His book Sadi’s Narrative of Exile was published in Tehran in 2008. Teaching Persian (Farsi) as a less commonly taught language, he has applied a “communicative approach” in his classes, which is also the method he has used in compiling his introductory level Persian language course book Persian: Here and Now.